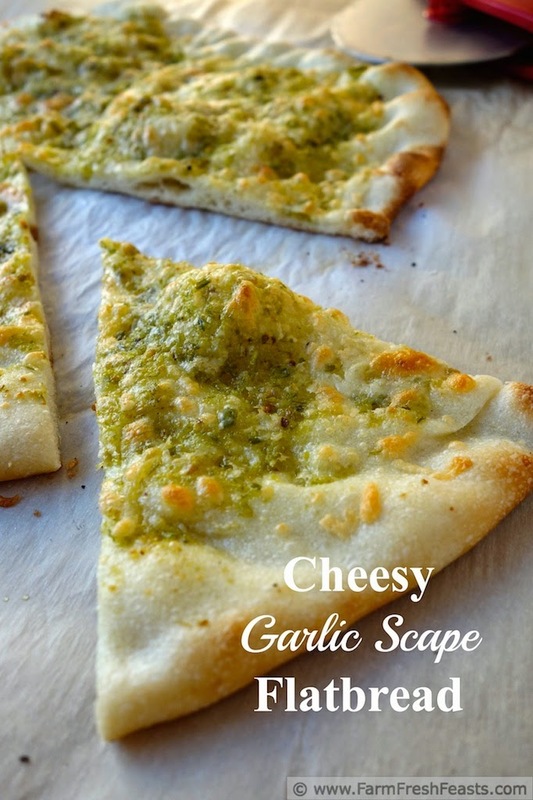 Mild garlic flavor from the garlic scape pesto, plus plenty of shredded cheeses, makes a Cheesy Garlic Scape Flatbread--a seasonal treat that can be enjoyed year round thanks to your freezer. 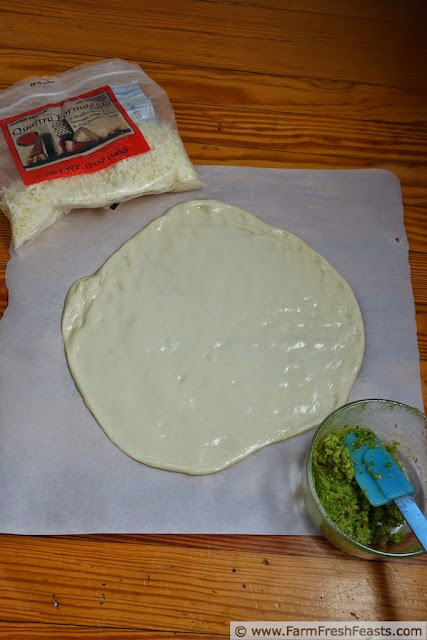 I want to talk about making pizzas at home, and share a way you can keep it innovative. Having a stash of pizza topping options in the fridge and freezer keeps our weekly pizza nights interesting. It's super simple to throw some leftover protein (chicken, ham, ground beef--links to some of my pizza posts) onto a meat-containing pizza. It's a breeze to add fresh vegetables (peppers, spinach, or mushrooms--more links to suggested recipes) and/or preserved vegetables for a vegetarian pizza. I store a lot of pizza cheese in the freezer [NOT always a good idea to use in a pizza], have a vat of feta standing by, and sometimes you don't even need cheese [this would be the place where I'd link to the Beef and Broccoli Pizza if it had been posted]. It takes some time to build up that pizza topping stash, but it's worth it. Preparing a batch as each vegetable hits peak season means that I'm not constantly slaving away in the kitchen [it only seems like that in August-September with the tomato canning, though, like childbirth, I'd do it again] yet I get to enjoy a wide variety of homemade, locally grown sauces on our pizzas throughout the year. I don't want to tell you what to do want to subliminally brainwash you to consider trying to put up one pizza topping in your freezer this summer. Here's some suggestions, in order of when they're ripe and ready throughout the season--all of these store well in the freezer. Think about it and get back to me. In the meantime, here's one way you could use your bounty: pizza. I started off by sharing how I put up my scapes in the form of pesto, combined with a variety of leaves (I'm partial to parsley and basil) as well as an assortment of nuts (I'm partial to pistachio and sunflower seeds). I use this pesto in all sorts of things, from Hummus to Shrimp Scampi and now, because it's a Friday and my family likes our Friday Night Pizza Nights, on a pizza. 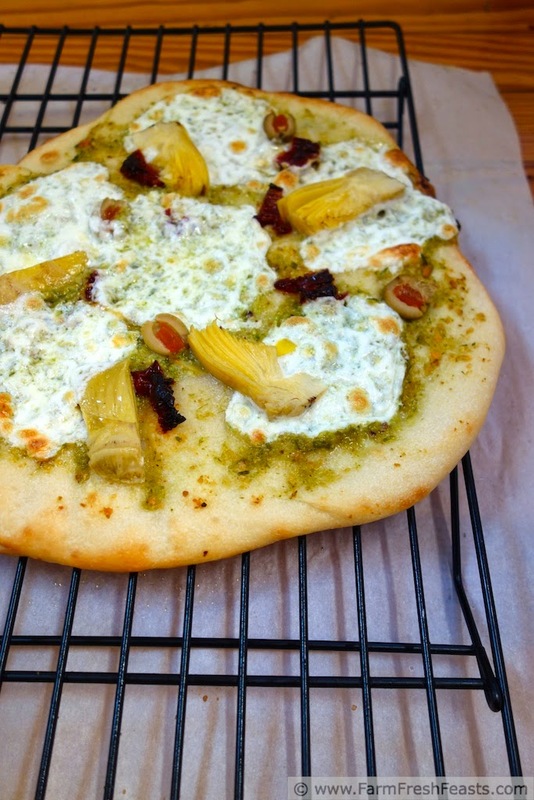 I made two pizzas using this Garlic Scape and Pistachio pesto: a plain cheese one and a more involved Sun-dried Tomato, Artichoke, and Olive with Fresh Mozzarella pie. Since I was making a number of pizzas, I told the kids to go ahead and eat the cheese one while it was hot. By the time I joined them they'd nearly demolished it and my son told me "this tastes just like cheesy garlic flatbread". Well, now I don't have to come up with a creative title--thanks! 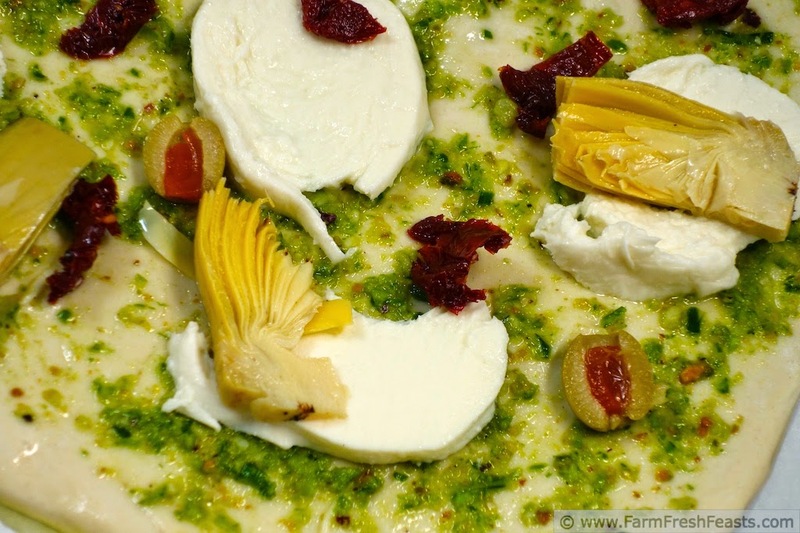 For more recipes using garlic scapes, please see my Garlic and Garlic Scapes Recipes Collection. It's part of the Visual Recipe Index by Ingredient, a resource for folks like me eating from the farm share, the farmer's market, the garden, the neighbor's garden, and great deals on ugly produce at the grocery store. NOTE: This recipe is not gluten free as written, because I used pizza dough containing gluten. To adapt this recipe for a gluten free diet please substitute the gluten free pizza dough of your choice. Preheat oven to 450 degrees Fahrenheit, and if you've got a pizza stone, preheat that as well. If not, use a cookie sheet. Here's an Amazon affiliate link to a stone similar to mine. On an oiled piece of parchment, which has saved my bum many a time for utter pizza catastrophe, stretch out the dough into a shape that pleases you. Put it on the floor and take a picture. 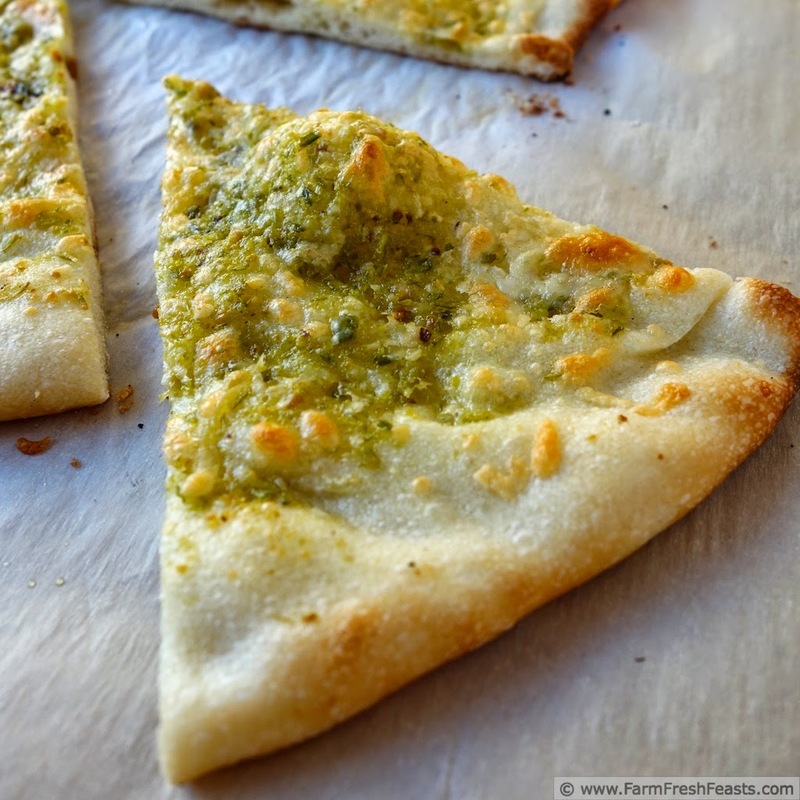 Brush the dough with some olive oil, then spread pesto across the top in a thin layer. Scatter cheese across the top. Bake for 5-8 minutes on the parchment, then shimmy the crust off the parchment and bake directly on the stone (or cookie sheet) for another 3-5 minutes until the cheese is browned and bubbly. Slice (Amazon affiliate link to my favorite pizza slicer--it's a workhorse) and serve. Save any leftovers to serve alongside spaghetti--it's an excellent combination. I will see you your one pizza topping (regular pesto, garlic scape pesto, and tomato pesto) and raise you one more: caramelized onions. That can make an equally delicious topping. Oh, caramelized onions on pizza sound amazing. Caramelized onions is amazing, period. But Meghan, I'll see your caramelized onions and raise you the onion marmalade. To die for! Give it a try. You're both right (though technically I've not tried onion marmalade). Caramelized onions are easy to make, store in the freezer--label them, or else--and are delicious on pizza. Angie I planted 80 red onion sets in my front yard flower bed, and though Mama Bunny unearthed one or two to plant her babies, the rest are growing fine. I'm going to need to investigate this onion marmalade. I can't wait for garlic scapes! Never ventured much beyond stir frying. 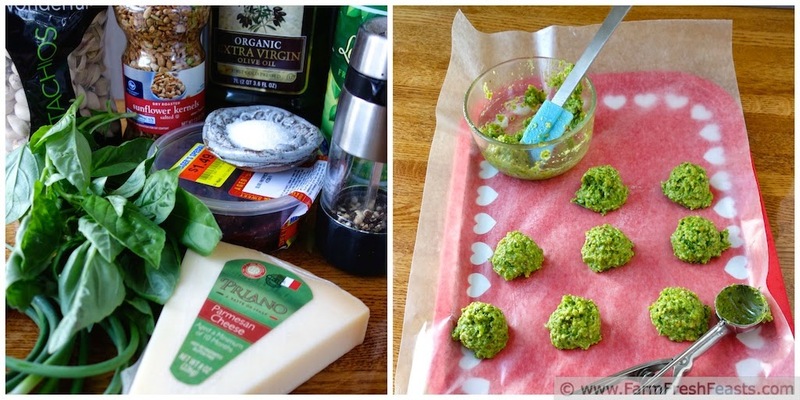 Garlic scape pesto sounds pretty awesome. What about using them in place of scallions in Chinese scallion pancakes? Anybody tried that? That's a brilliant idea--I was thinking Korean vegetable pancakes for this year, but if you do Chinese scallion pancakes w/ garlic scapes I'd love to add your link& photo below. Holy yum! I've seen a lot of recipes for garlic scapes recently, but I haven't used them yet. I am going to have to change that this summer! Every day I check my garlic bed, waiting for the first appearance of scapes. I know, I know, I should be patient--and I have no choice, really--but yeah, big plans here too. I'm so impressed by how organized you are, keeping the fixings for such creative pizzas in your freezer. If you could see the bag of newspaper clippings I'm supposed to read and the general lack of dusting of the mantels you would not be so impressed. However, pizza is a priority around here, so I do have a stash ;) . At times I wish dusting was a priority, but sadly it's just not. Wow, what an awesome variety of ideas for pizza and storing of ingredients. Thank you for hosting! I'll be there with bells (on) & burgers (on a plate)! I need to start making roasted garlic in bulk and putting it up in my freezer... It's delicious and I love it, but it's so maddening when a recipe calls for like, a tablespoon of it for a recipe, because it does take awhile to make. And it's much easier to make a larger batch of it at a time. Thanks for posting this! It really is a timesaver--and since I get my garlic crop once a year it's also a way to ensure I don't end up with dried out husks (ok, I'm hearing this in the voice of the overly made up girl from the IT crowd FriendFace episode, which probably speaks to my nerd-ness). So incredibly delicious! Thanks for linking up with What's Cookin' Wednesday! You bet--garlic & cheese is just an amazing combination. These flavors are just so good together!